This article is continuing the MySQL 5.7 Performance story, started from 1.6M QPS on MySQL 5.7 details post , then 1M QPS on mixed OLTP_RO with MySQL 5.7 article, and detailed story about why the Point-Selects performance is so critical (and why the 1M result published by MariaDB is not fair).. 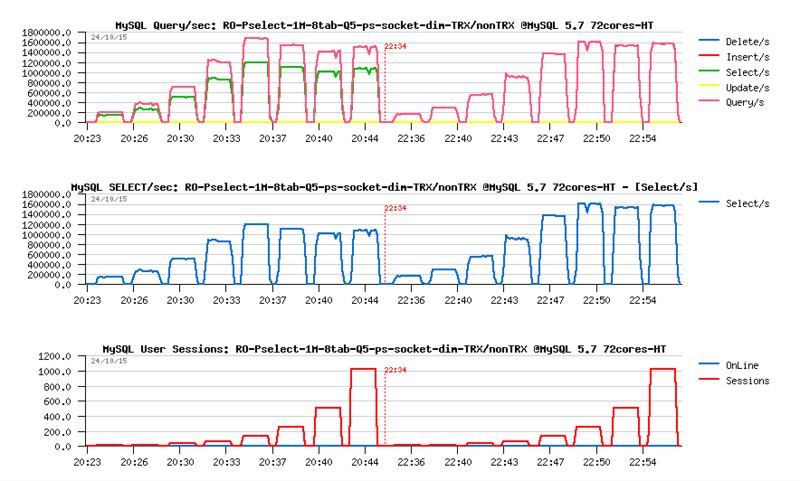 The current story will be about Connect/sec (connect/disconnect) performance improvement in MySQL 5.7 - such kind of metric is very critical for any application which cannot use persistent connections all the time (and many web apps are in such a case). Well, I'd say MySQL from the beginning was extremely good for its lightweight connections, and made in the past the base of success for many web solutions.. However, time is going, and we're no more with 4cores as "commodity hardware" (this is rather a smart-watch today ;-)) - so, there was a need to speed-up this Connect rate to match higher workloads. This was already greatly done in MySQL 5.6, and finally yet more improved in MySQL 5.7 - you may read all details about directly from our developers - I'll just present here a short summary about where we're today..
means on every point-select query your client session will re-connect, and the final QPS result will give you the max Connect/sec rate your MySQL instance is able to reach for a given amount of concurrent users. it's hard to speak about "scalability" here as the max possible Connect/sec rate limit is reached pretty quickly and depending on IP stack performance as well..
tuning "thread_cache_size" to something bigger than zero is helping here, but not too much..
MySQL Performance: What is odd with 1M QPS claimed by MariaDB 10.1 ?.. So far, MySQL Team was proud to show 1.6M QPS on Point-Select (SQL) queries, and MariaDB 10.1 GA announce was also claiming an ability to reach 1M QPS, also on Point-Selects, but on POWER8 HW. And I may be only happy for MariaDB team for their progress on POWER systems, except just one small detail related to how their 1M QPS result was obtained.. But first of all, what are these Point-Selects and what is so special with this workload ?.. so any internals overhead in engine code, any contentions, any scalability limits are seen very quickly..
historically such kind of workload did not scale very well on MySQL/InnoDB tandem..
while on the InnoDB side there was a huge general overhead related to transactions management + related locks..
no transactions clauses used, no grouping..
How does this change the initial workload test case ? by grouping 1000 queries within a single transaction we're lowering a lot the whole related transaction locks..
but did you see many real cases when a single MySQL session is grouping 1000 SELECT queries within a single transaction ?.. but well, even they are really short as point-selects.. -- what kind of application will run them by 1000 in a single shot ?.. such kind of a "workaround" we proposed yet to our users when started to ship MySQL 5.6, but always mentioned that this is as a workaround, not a final solution (as this could help when you're really have many fast SELECTs and you can really group then within a single transaction without breaking your apps logic).. -- but as soon as potential amount of SELECTs to group is small, the transaction overhead is quickly eating your gain..
MariaDB 10.1 is reaching over 1.4M QPS (so, not only on Power while running within a "workaround" test conditions)..
as you can see, less queries executed within the same single transaction - lower QPS is reached..
while MariaDB 10.1 is going from 1.4M QPS to just 600K QPS..
On the last test, with 5 point-selects within a transaction the lower QPS is also impacted by round-trips of BEGIN and COMMIT statements around transaction.. What the result will be if I'll not use transactions? while MariaDB 10.1 is going yet more down to just slightly higher than 400K QPS only..
and as we're wasting CPU cycles to process BEGIN and COMMIT - we're doing less SELECTs as the result..
as you can see there is a huge gap between MySQL 5.7 and any other engine on 32, 40 and 72cores-HT HW..
the gap on 72cores-HT HW is way bigger only because MySQL 5.7 is continuing to scale and reaching a yet more higher result, while all other engines are already reached their limits and cannot go anymore further..
From where is coming such a great scalability gain in MySQL 5.7 ? so far, all the credit is to our great MySQL Engineering Team! (all the listed stuff above is related to fundamental changes invented and implemented by our Engineering, taking us months and years of heavy work).. When MariaDB will be able to scale as far as MySQL 5.7 ? When Percona Server will scale as far as MySQL 5.7 ? they should be soon available from the OpenWorld site as well. again, all the focus here is on MySQL scalability limits, nothing else..
why we're paying so many attention to these "simple" queries from Sysbench ?.. these simple tests in fact are extremely aggressive, and bombarding all engine internals very heavily..
the point-select, for ex., is extremely fast and crossing on every pass the whole engine stack from entry to end point & back..
while the distinct-ranges is extremely aggressive on malloc() scalability + in-memory temp tables management..
so, if your production workload is based on much more complex queries, and you're suspecting scalability issues -- rather to stay negative, send us your test workload and share your observations -- we cannot improve everything within a one single shot, right? -- there is still so many things to do yet.. I was told several times during the MySQL Central conference and other user meeting that 72cores config is waaay toooo big..
just think that this is the same 4CPU sockets server as we used before..
just that today's Intel chip has 18cores per socket -vs- 10cores we saw before, and the CPU chip itself was also greatly improved..
well, if 4CPU is still toooo biiiig for you, will be 2CPU is "good enough" ?.. and this 2CPU 36cores-HT config is already showing a way better QPS than we observed on 4CPU 40cores-HT before !! keeping in mind that the next Intel chip will give you 48cores-HT (24cores-HT per CPU socket)..
Well, a long story short, let's go directly to the test results. MySQL 5.7 is reaching 1M QPS on OLTP_RO !! (while seems like there is still a room for progress).. Note that except MySQL 5.7, the difference between MySQL 5.5 result and other engines is not that big..
(and if you payed attention to the previous article, you may see that on point-selects MySQL 5.5 is reaching the same max QPS as all other engines, except 5.7)..
so, yes, the huge gain you're seeing here for MySQL 5.7 is coming due all this heavy remastering started from TRX-list re-design 2 years ago and continued on all levels till 5.7 GA release..
MariaDB 10.1 is the worse again, just better than the oldest MySQL 5.5..
Now the same workload, but using only a single 10M rows table. it was not able to show anything better on 32 or 40cores-HT configuration..
and as you can see from the 5.5 scalability graphs, 1CPU socket is just enough here..
but on the newer CPU it's doing yet x2 times better (even without scaling well)..
my.conf -- used exactly the same config settings as in the previous article.